This morning was the day for Mike and I to sleep in and for the boys to watch a brand new DVD that Nathan received for his birthday. They've been on restriction from TV and movies this week, so we figured that the new movie would keep them quiet while we got a little extra sleep. However, come 8:00 AM, I was wide awake. I was hoping to stay asleep a little longer! I came out to the living room where the boys were both quietly playing with Lego (every Mom's dream: two kids, playing nicely together!). 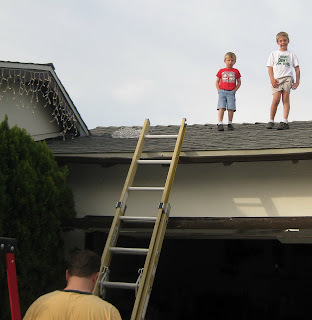 We had planned to put up Christmas lights on the house today, so I thought I'd get the kids in the mood with a viewing of The Polar Express while Daddy slept awhile longer. 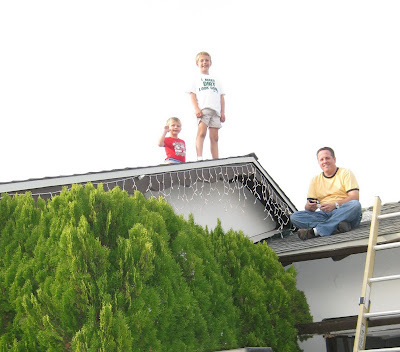 Later in the day, all three of my guys climbed up on the roof to attach the lights, which was more than I could handle watching! In a college lighting class, I suddenly developed a completely irrational fear of heights that I'd never had before. Unfortunately, it hasn't left! Seeing my babies up there made me flee the scene... I ran to the grocery store to stock up for the week and came home to our house beautifully lit! We finished the evening with the first viewing of Elf for this year, a movie that my boys love (especially the prolonged belch that Buddy the Elf lets out after chugging an entire 2-liter bottle of Coke!). The house isn't completely done, but my personal lighting design team made great progress. And no, we are not the first house on the block with Christmas lights up... there were two houses who had theirs up on November 1st! By the time Christmas rolls around I suspect we'll all be sick of it, but for today, it's jolly good fun! Okay, I still have an irrational fear of heights and seeing these photos makes my heart beat harder and my hands start to sweat. I'm glad to see that you are not passing your fear on to the boys - despite how hard it was for you to see them there.